The new Suicide Squad film is fast approaching, and we're here to provide you a brief summary of the comic book origins of the characters in the film (especially the ones who played a big part in DC comics during the 1980s). Katana, the character, is very familiar to me. I was one of those kids who grew up reading Batman and the Outsiders (and, by extension, The New Teen Titans) because an older cousin donated a heaping pile of unwanted comics to me. 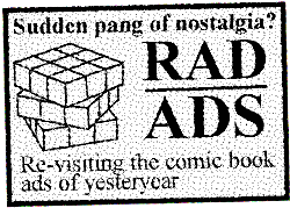 I could easily write this entire article based on anecdotal observation and my memories of reading Batman and the Outsiders (and later The Outsiders v1 Baxter edition), but - for the sake of keeping this interesting - I'm going to try to include as much source material as I can. 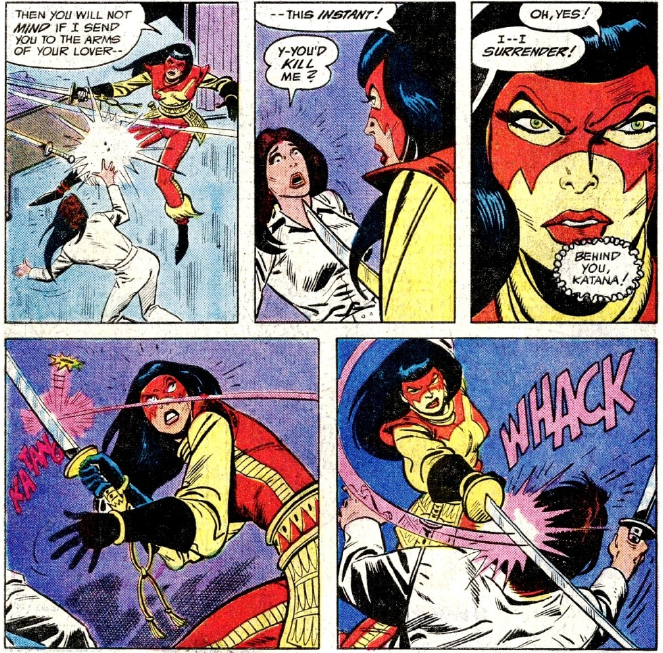 Katana, created by Mike W. Barr and Jim Aparo, first appeared as a member of a brand new Batman-led team called 'The Outsiders'. Other than Batman (who is the main reason a lot of us picked up this title - admit it), Katana was the only non-powered member of the team. This new team book (according to DC editorial) required a mix of existing DC characters and some brand new ones [I'm suspecting they were using the 'New Teen Titans formula' here]. Black Lightning (created by Tony Isabella and Trevor Von Eeden) and Metamorpho/Rex Mason (created by Bob Haney and Ramona Fradon) had both been added to the team because they seemed like an interesting fit and had already acquired a bit of a fan following. Katana, Geo-Force and Halo were brand new characters conceived by Mike W Barr. "Well, I was trying to, I had created a lot of character for the Outsiders, a variety of characters. You want guys who are not just big and strong or with great powers, you want to mix it up a bit. I always had an interest in Japanese culture, so I thought it’d not just be interesting to do a samurai, but a female samurai. And the samurai’s blade is the katana, which is a perfect name for the character with the nice sharp “k” sound, and the feminine “a.” It was almost impossible to misspronounce so it worked out well." "I had an interest in Asian culture and enjoyed tales of samurais and samurai characters. I thought it would be interesting to have a samurai on the team. Then, when the line-up came, there were a lot of male characters. I figured a female samurai may not be totally unique, but at least it was something that had not been done a lot. And from there, we came up with Katana." First impressions go a long way, and when the reader was introduced to Katana for the first time in Brave and the Bold #200 (1983) they met a woman in a garish samurai-inspired costume armed with a Japanese sword and a killer instinct, along with... apparently... random speech bubbles? A split personality, perhaps? 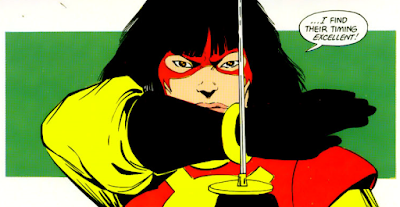 Barr introduces Katana as a character shrouded in mystery — not really one for chit-chat, but more of 'a woman of action'. It's also established from very early on in the Batman and the Outsiders ongoing series that she suffered a great personal tragedy. Among other things, Katana possesses a strong sense of commitment towards the code of honor and morals followed by the Japanese samurai. She's also portrayed as a very independent woman — she is no 'damsel in distress' by any means. A ferocious hand-to-hand combatant, unless my memory is failing me, I believe that she is the only Outsider that seems to kill her opponents in battle (depending on the writer). 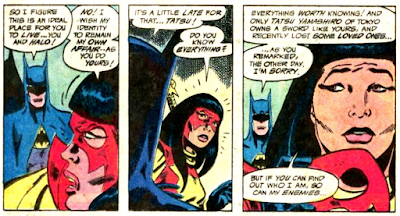 To further the point about Katana being an independent woman: she wasn't recruited by Batman, she just kind of joins the team due to common goals. 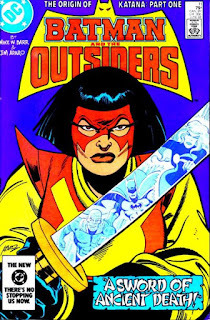 As the Batman and the Outsiders series progresses along, we gradually learn more about Katana. Those mysterious speech bubbles mentioned earlier? In issue #7 it's revealed that it's her sword talking to her. 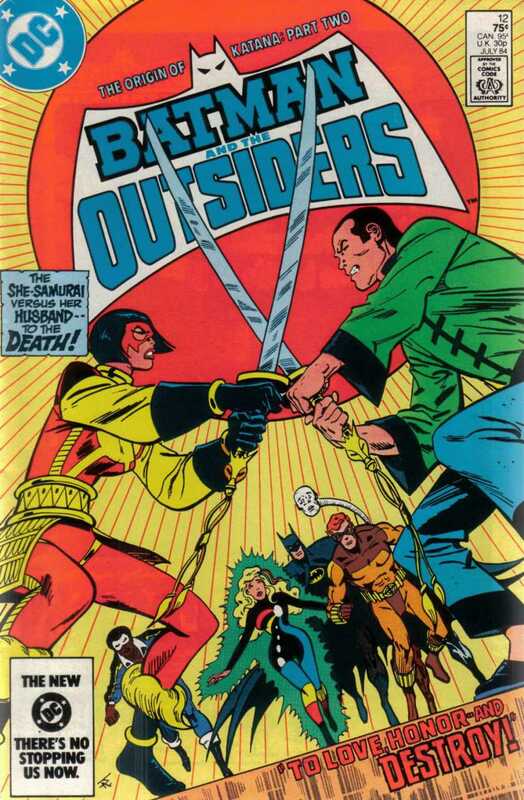 Barr did a fantastic job at keeping the reader engaged in the 'mystery of Katana' throughout the first year of publication of Batman and the Outsiders v1. He never reveals too much, just enough to keep you guessing the background of this intense character. Character development was a key component in this team book, which is another reason why I suspect it had a pretty strong fan following in the first few years of it's publication. 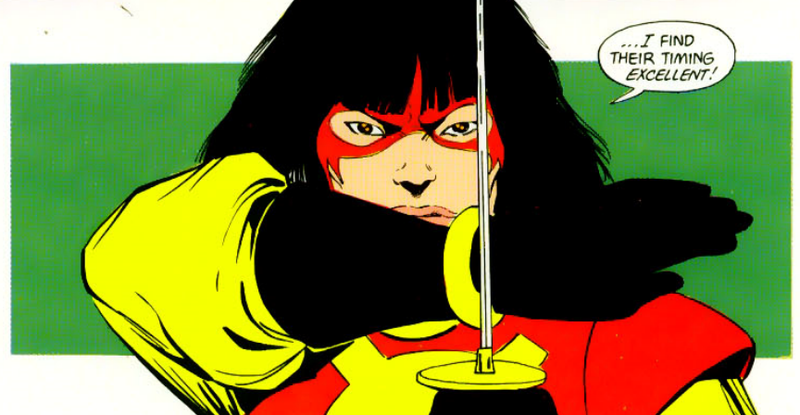 Another important aspect of Katana, established very early in the ongoing series, is her maternal relationship with the child-like Halo. Throughout the series, you can see the bond between Katana and Halo grow, and would demonstrate the softer side of the battle-hardened Katana (this relationship would sometimes be used for comedic effect during the Outsiders v1 series). At some point it is worked into the series that Halo becomes Katana's ward. "One of the interesting things about Katana and Halo is that they were created to be sort of a mini-Batman and Robin team. But, as it turns out over the years, it seems like both characters can work just as well on their own, which I hadn’t foreseen. I’m certainly happy about it though, for dramatic purposes." 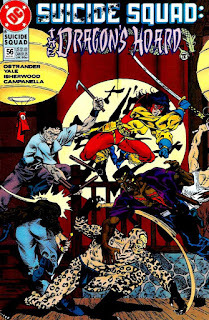 Finally, after nearly a year of build up, all is revealed in regards to the origin of Katana in Batman and the Outsiders #11 and #12 (1984). Her sword is called 'the soul-taker' and it's an enchanted sword that somehow captures the souls of the people it kills. Her husband was slain with that very sword (by her brother-in-law — same guy who killed her children) and it's her husband communicating to her through the sword. Also, she has some sort of bad blood with the Yakuza due to ties with her brother-in-law. With that, the mystery of Katana and her sword is revealed. 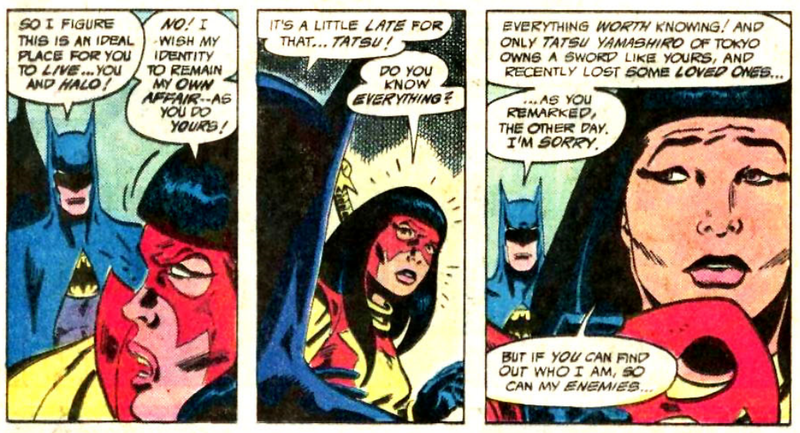 To be completely frank with you, nothing really significant happened to Katana during the 1980s after this two-part story arc resolved. 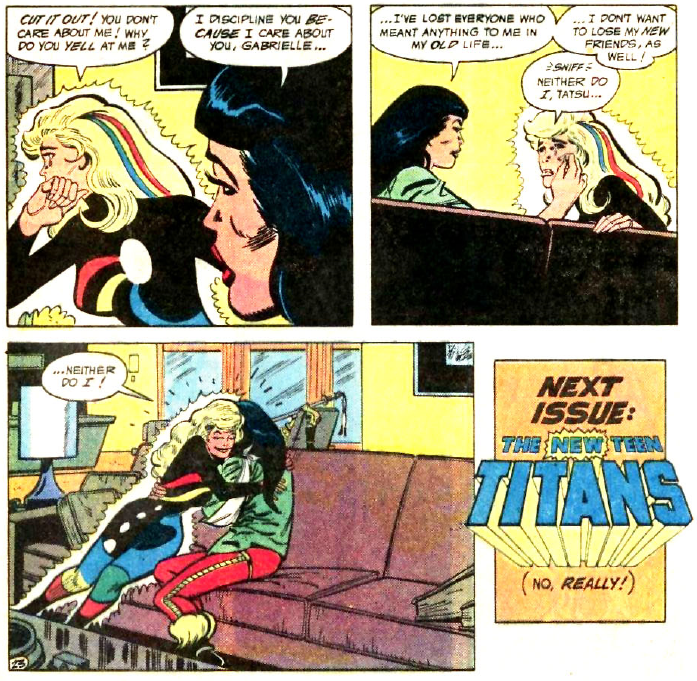 During this time period she was tightly associated with a solid team book (i.e. Batman and the Outsiders, Adventures of the Outsiders, and The Outsiders v1) that lasted from 1983 to 1988. The series ended on a cliff-hanger with Halo taking a bullet laser blast from a Manhunter meant for Katana during the Millennium cross-over event. Barr did a great job with this character. He was writing a team book and juggling a cast of 6 characters, making sure that they all got a fair bit of attention, while moving the series forward and sending the team on adventures and etc. 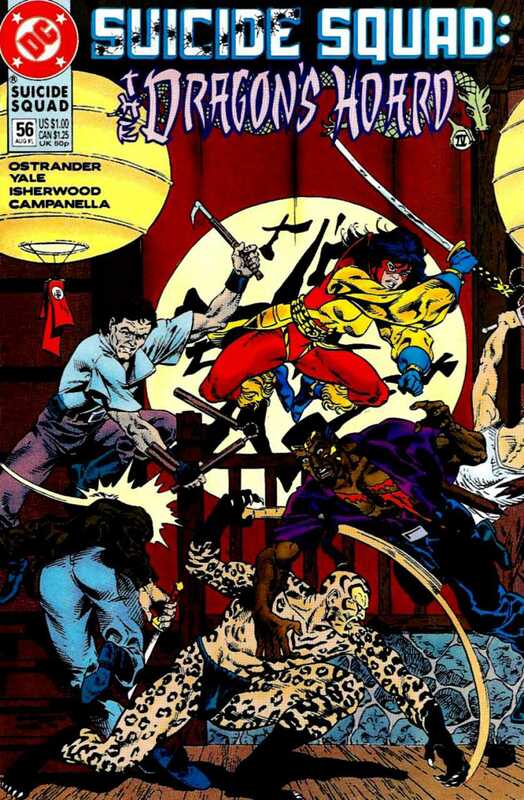 Various characters got the spotlight after Katana's mysterious origin was resolved — most notably Metamorpho, Halo and a new recruit named Looker. It's apparent that Katana took a back seat during the Baxter edition of the series as a lot more attention was given to Halo and Looker. Since this is an article inspired by Katana's recent appearance in the new Suicide Squad film, I'd be remiss not to mention her Suicide Squad appearance in 1991's "The Dragon's Hoard" story arc (Suicide Squad v1 #53 - #57). 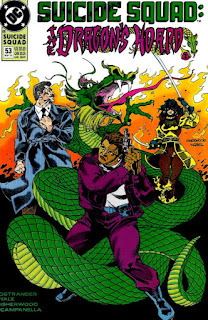 I'm not going to give you the entire play-by-play of the five issues (I'm sure Jason Brown will get to it someday), but Katana worked alongside the Suicide Squad in a joint effort to take down the Yakuza. This was her first appearance in 3 years after being last being spotted in the 1988 Invasion cross-over. As previously mentioned, the most interesting parts of this article (in my humble opinion) came from two fantastic sites each containing two equally fantastic interviews. 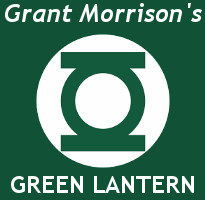 Both Graphics Policy and Comicosity are two comic blog/review/news sites I'd strongly recommend checking out.